One Global Warming Trend with Seven Pauses! It just goes to show that Global Warming isn't a uniform process but a stair-step phenomenon that occurs in fits and starts. "One of the most common misunderstandings amongst climate deniers is the difference between short-term noise and long-term signal. This video shows how the same temperature data (green) that is used to determine the long-term global surface air warming trend of 0.18°C per decade (red) can be used inappropriately to "cherrypick" short time periods that show a cooling trend simply because the endpoints are carefully chosen and the trend is dominated by short-term noise in the data (blue steps). Isn't it strange how seven periods of cooling can add up to a clear warming trend over the last 4 decades? Several factors can have a large impact on short-term temperatures, such as oceanic cycles like the El Niño Southern Oscillation (ENSO) or the 11-year solar cycle. These short-term cycles don't have long-term effects on the Earth's temperature, unlike the continuing upward trend caused by global warming from human greenhouse gas emissions. "The data (green) are NASA GISS monthly global surface temperature anomaly data from January 1970 through November 2016, with linear trends for the cherry picked time periods of Jan 1970–May 1977, May 1977–October 1979, October 1979–April 1988, April 1988–March 1997, March 1997–February 2002, February 2002–October 2009, and October 2009–April 2014 (blue), followed by the linear trend for the full time period (red)." The same sort of thing could be plotted on a graph from each of the Hadley Centre's HadCRUT4 temperature data, Cowtan and Way's HadCRUT4-kriging, the Berkeley Earth data, and the NOAA NCDC data. And a bonus video: confirmation of previous global warming models' predictions using the NASA GISS data for annual globally averaged mean temperatures. Teaser photo shows the famous Pause! It is extremely difficult to get an American to see the roots of the global warming problem when his lifestyle depends on him not understanding it. First, the basics: what is causing our weird, extreme weather? Climate change. What is causing climate change? Global warming. What is causing global warming? Ever-increasing amounts of CO2 and CO2e greenhouse gasses in the atmosphere. What is causing these greenhouse gasses to increase? The burning of fossil fuels. And what is causing the combustion of fossil fuels? Well I don’t have to answer that question! Take, for example, the recent wildfires in California and heavy snow from South Texas up to Atlanta and heading for the USA Northeast. “It’s an odd juxtaposition, driven by a highly amplified weather pattern. 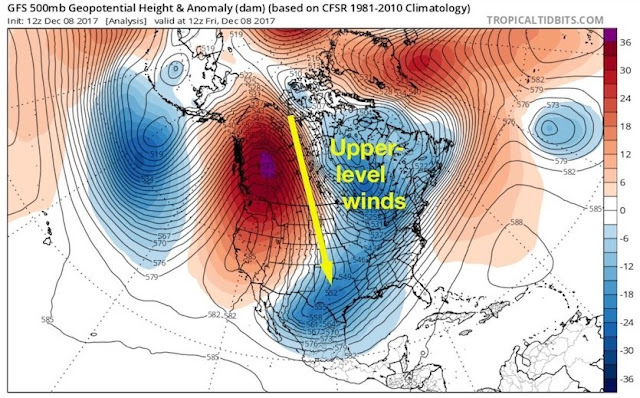 Winds at the jet-stream level on Friday were blowing from the Canadian Arctic south across the Great Plains all the way to Mexico.” This weird weather would have been far less likely had had this Arctic-to-Mexico jet stream diversion not been in place. But a few years back, Dr. Jennifer Francis predicted that as the globe warms, such diversions and the crazy-weird dipoles in the weather that go with them would become increasingly common. The Nunavut Express, or, Arctic-to-Mexico jet stream diversion. The jet stream most likely went south around that patch of cold and low pressure over the Pacific and then went north around Alaska, too. There is a high-pressure ridge and zone of warm air along the whole west coast of North America. Circulation around high-pressure ridges is clockwise; around low-pressure troughs, anti-clockwise. I know this is obvious, but some people, what with the state of “education” in the USA…. Source: Wunderground.com. Another thing that people simply cannot understand or accept because their lifestyles wouldn’t allow it, is that we have a significant temperature rise and sea level rise baked into the cake. Back in the Nineteenth Century the CO2 Content was 280 ppm. Today it is 410 ppm with 490 ppm CO2e (including the CO2). Our current temperature is about 1.1 deg C above 19th Century values. For some reasons, this temperature rise is lagging behind the fully adjusted short to mid-term temperature by about 0.5 deg C for just plain CO2 (1.6 deg C), 1.3 deg C for the total CO2e (2.4 deg C). Which means we have quite a bit of further global warming baked into the cake! Let’s see: 1.6 deg C above the mean preindustrial temperature is about the maximum interglacial temperature reached before the Earth plummeted back down into ice ages during the Pleistocene Era. Of course, there is an uncertainty spread of +/- 2 deg C that far back---but James Hansen has hypothesized that superstorms tend to show up at around that 1.6 deg C temperature rise, and has demonstrated that they showed up in the past interglacials. 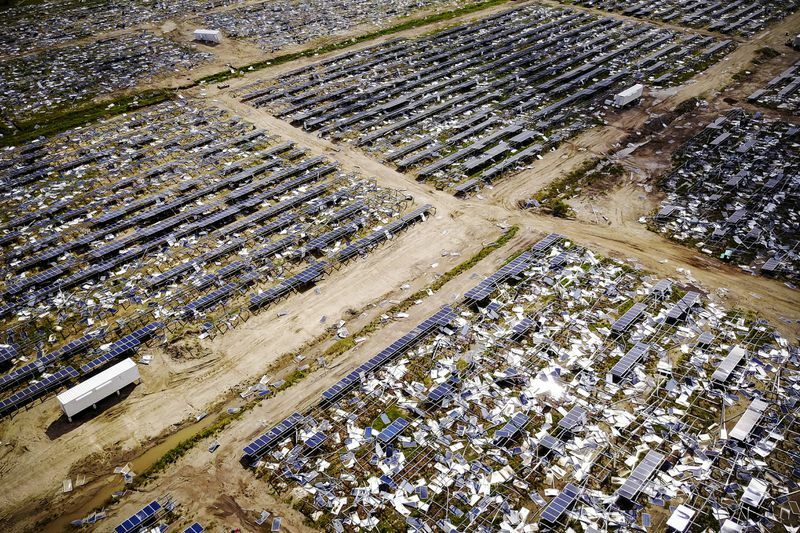 Superstorms that can wreck our civilization. When we were in the last ice age, the coldest part of it, roughly 18-20,000 years ago, the seas were about 420 feet lower. Carbon dioxide levels rose from 180 to 280 parts per million before the Industrial Revolution, and the seas rose 420 feet, to where they are now, And they didn’t do it in an even slow curve, but in a series of steps, rapid bumps and pauses. All across our continental shelf, we have barrier reefs, old coastal mud flats and tidal delta complexes. The record of sea level change is there. This is why scientists are rightfully saying we’re probably going to have 70 to 80 feet of sea level rise, because the last time we were at the same CO2 levels we have now, that was where the sea level was. Hal Winless, Professor and Chair of the Department of Geological Science at the University of Miami, as quoted by Ashley Dawson, Extreme Cities, p. 20. That much rise in sea level---70 to 80 feet---will completely submerge many of the coastal cities around the world. A far smaller sea level rise will submerge their ports, and make the cities utterly dysfunctional, global sea-trade completely impossible, and global trade by air much more difficult (because some of the airports are at or slightly above sea level such as Miami International Airport, JFK in New York City, Newark International in New Jersey, Logan Airport in Boston, etc.). Now one side doesn’t even think global warming is even happening! My experience is that these old horses have come to the water but they’ve refused to drink because they prefer the taste of Kool-Aid! The other side is worse: they think we can slightly adjust our American lifestyle and everything will be fine (hybrids, fluorescent lightbulbs for the home, recycling, composting, etc.). They also think that mass-producing electric cars and trucks to replace the internal combustion and diesel engines, and switching our entire energy infrastructure from fossil-fuel dependent to one reliant on renewables (strictly wind and solar) is feasible. 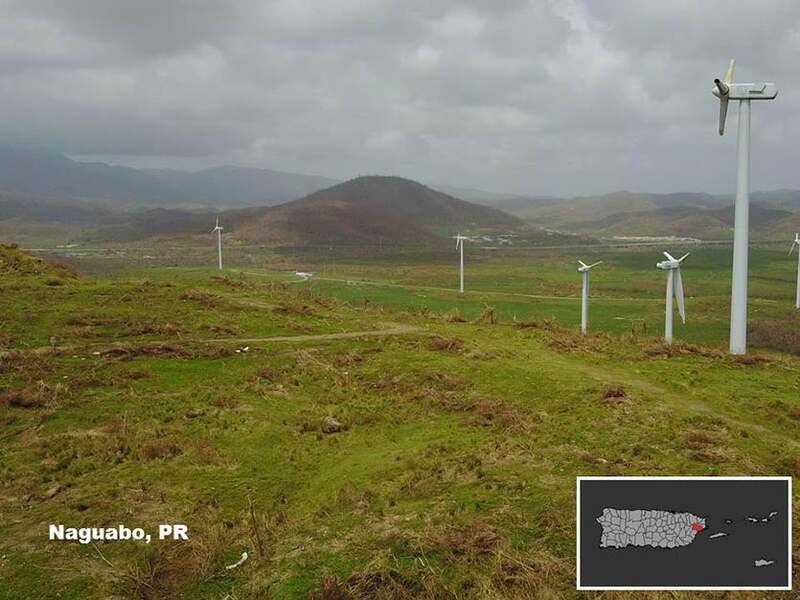 Photos from the recent devastation of Puerto Rico shows us what happens to wind turbine farms and solar panel installations in the face of a Category 4 hurricane, and the damage indicates otherwise. The ugly reality is, we will have to change everything we do. And nobody wants to hear that, because of the built environment that our fathers, grandfathers and great-grandfathers have bequeathed us: compulsory automobility. You cannot go without a motor vehicle in almost all of this country the USA and expect to be able to earn a living and have a life! And the places where you can go without an automobile are inordinately expensive, enough to be unaffordable as a place to live for most. And guess where I live: in an older city, but not in an area where I can function without a motor vehicle. Well it’s been quite a hurricane season in the Atlantic so far, hasn’t it? It’s even gotten the notice of the UK press. Source: Philip Klotzbach, via Twitter. 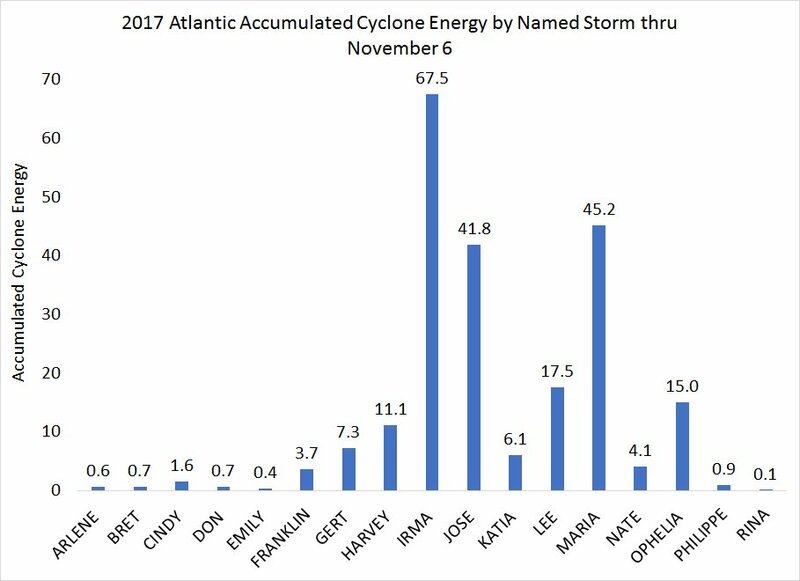 We’ve had six major hurricanes this season (Harvey, Irma, Jose, Lee, Maria, Ophelia), three of them exceptional in the amount of cyclonic energy they’ve accumulated and expended (Irma, Jose and Maria). The UK Express notes that Harvey has had the largest rainfall and Irma has had the longest duration as a Category 5 hurricane, ever (at least since 1851 and possibly since the Eemian). 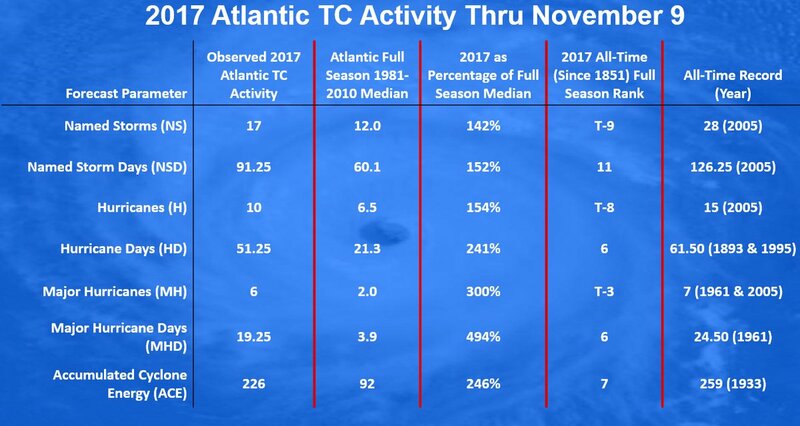 The above seven parameters each have the 2017 Atlantic hurricane season in the top twenty seasons since 1851, six of them in the top ten—although only one in the top five. Now does this mean anthropogenic global warming’s had anything to do with this? Well according to Kerry Emanuel, atmospheric scientist at MIT, the 2017 hurricanes are merely a foretaste of the future and that the increased damages from hurricanes due to ever-increasing development of the shorelines is being exacerbated by rising sea levels and changing storm characteristics due to anthropogenic climate change. He also says that the average annual number of hurricanes has increased, that the probabilities of hurricanes like Harvey and Irma have already been changed, and that as the climate warms these storms will continue to gain strength until they reach their inherent limits and their maximum size will begin to level off as well. The UK Express alleges that Prof. Emanuel said that “hurricanes with the magnitude of Hurricane Harvey had gone from a once a century event to a once every 5.5 years event.” The real reality is that Prof. Emanuel states in his video that in the time period 1981-2000, Harvey would have been a 2,000-year storm, and could become a 100-year storm in 2081-2100. If I recall correctly, this year NOAA said Harvey was a 500-to-1,000-year storm. More on Harvey: 1% chance of same rainfall for anywhere in Texas in the 90s, now 6% Chance in any one year. On the other hand, climate scientist and climate forecast consultant Dr. Judith Curry states it’s way too soon to tell, that each individual hurricane should be subjected to diagnostics---instead of using models to create imaginary storms in a world not subject to global warming---to determine if global warming has had a hand in it. She notes that there have been busy hurricane seasons in decades past and even some notable hurricanes in the Nineteenth and early Twentieth Centuries. So isn’t all this is just the noise from natural variability? Or is it? You can go to this and this webpage put up by Weather Underground and view the statistics therein, pursue the linked webpages therein (here’s one, another one, and another one), and view the hurricane FAQs and years with the most hurricanes webpages at the NOAA website. Note, the pages are not updated for 2017 (except the one about Irma). You can review these pages and decide for yourself. As far as I’m concerned, our weather has gotten more extreme---and weirder, to boot. Speaking of weird weather, there’s disturbance that might become a named sub-tropical storm, Sean. Near the Azores. In November. Now I will come to the conclusion of this three-part series ad show you how well Michaels and Knappenberger’s Climate Models and Climate Reality: A Closer Look at a Lukewarming World has held up. Because if the trends indicating a gross overprediction in the IPCC CMIP-5 model runs, a slower warming and a smaller climate sensitivity, which are the Cato paper’s conclusions, are broken, then their conclusions are liable to be ill-founded as well, which means we could be right back at the IPCC’s median estimate of 3.0 deg C ECS (Equilibrium Climate Science) sensitivity---give or take 1.5 deg C.
Chart G: Global Mean Surface Temperature Anomalies from the 1908-1999 Mean. Anomaly measurements are in degrees C. The CMIP5 Ensemble used has not been blended according to the Hadley Centre’s HadCRUT4 method of accounting for land surface air temperatures and sea surface temperatures. The forcing-adjusted CMIP5 takes into account the updated (historical) forcings to date. The NASA GISS’s GISTemp plotted temperature rise is shown by the red line; the Hadley Centre’s HadCRUT4 by the blue line. Cowtan & Way’s plot and the NOAA NCEI plot are shown by the orange and pale blue lines respectively. The estimated 2017 GISTemp temperature plot and its uncertainty spread is courtesy Gavin Schmidt; the estimated HadCRUT4 plot and its uncertainty spread for 2017 are mine, based on the latest data available from the Hadley Centre website (accessed 11/07/2017). 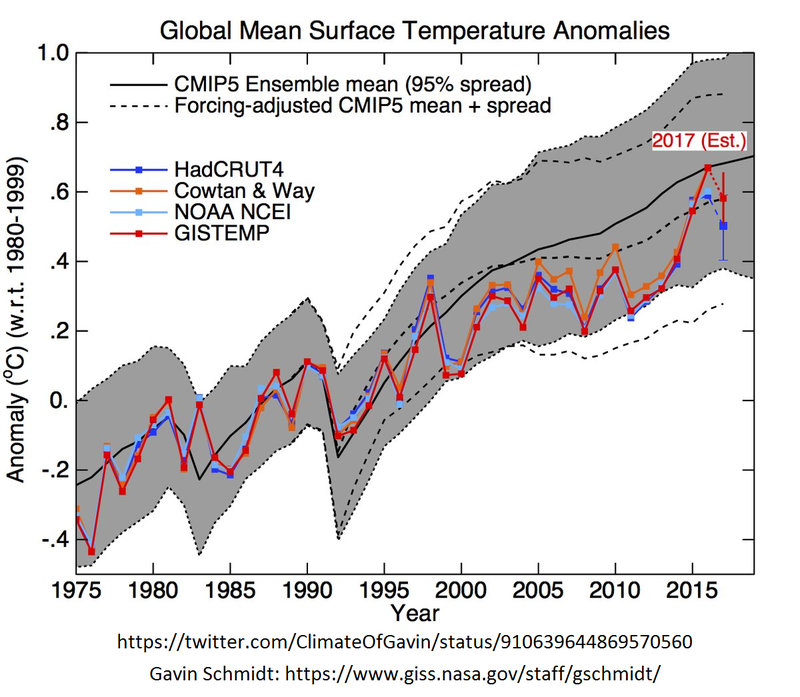 Nota bene that the upper end of this uncertainty spread is hidden by the GISTemp estimated temperature plot for 2017. The above chart clearly shows that the original CMIP5 model ensemble clearly overpredicts the amount of warming observed; the forcing-adjusted ensemble, less so. The NOAA NCEI and HadCRUT4 temperature plots dip below the 2.5th percentile line of the original ensemble and the original ensemble mean is only hit by the GISTemp and Cowtan & Way temperature plots for 2016, the year of a particularly strong El Nino. The estimated temperatures for 2017 show a drop of approximately 0.09 deg C for both the GISTemp and HadCRUT4 plots. Clearly, we still have an apparent overprediction problem here even though the planet’s mean temperature rise is no longer in the Pause. 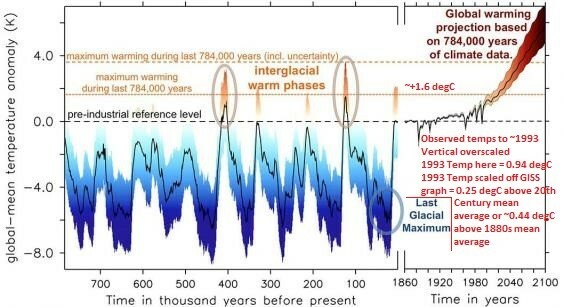 To check this we can simply do the same sort of trend runs that Michaels and Knappenberger did to indicate a slow rate of warming in their paper. Chart H. The trends for the predicted annual average global surface air temperatures taken from Chart G for the CMPI5 ensemble (pale green, purple and pale blue lines), and for the Hadley Centre’s HadCRUT4 (blue line) and NASA GISS’s GISTemp (red line) observed global mean temperatures taken from their latest data for a blend of land and ice surface air temperatures and ocean sea surface temperatures. Observed temperatures for 2017 are estimated as explained under Chart G above. The trends were plotted for all years from 1975 through 2008; the trend lengths run from 10 years (2008-2017) to 43 years (1975-2017). It appears that in the above chart the CMIP5 Ensemble trends are noticeably higher than for Figure 2 in Part 1. Only the Ensemble Mean trend for 26-year trend length, corresponding to 1992 the year after Mt. Pinatubo blew up, is anywhere close to equal to the Multiple Model-run Mean (MMM) trend shown in Figure 2, as checked in Chart D in Part 2. The observed trends for longest trend lengths appear at about 0.18 deg C/dec, well below the 2.5th Percentile line at approximately 0.20. After the 37-year trend length, the Hadley and NASA GISS lines begin to diverge. But the shorter observed trend lines after the 26-year trend length---YIKES! They diverge, run an arc and fly above the 97th Percentile line, crashing through the roof! And this is the problem with using short trend lengths; Cato’s figures 2 and 3 exhibit their shorter trend lengths showing trends dropping progressively toward the bottom of the graph, falling into the subbasement. The above graph shows the influence of the still-warmed global mean temperature(s) of 2017 coming 0.09 deg C off the El Niño-influenced peak temperature(s) in 2016. The trends for trend lengths shorter than 16 years also show the influence of the Pause---the longer into the Pause, the higher the trend. Trend lengths shorter than 10 years would show even higher trends approaching 0.85 deg C per decade. The IPCC CMIP5 Model Ensemble still overpredicts the amount of surface warming as can also be clearly seen in Chart G. This is because the Ensemble does not take into account the blend of land and ice surface air temperatures and ocean sea surface temperatures reflected in the observed data, and because the forcings under the RCP 8.5 (also RCPs 6.0, 4.5 and 2.6) scenario post-2006 were higher than the observed historical forcings after that year. Apparently the historical forcings between 1992 and 2006 were also erroneous and had to be updated, as shown in Figure 4 of the Cowtan et al 2015 paper, “Robust comparison of climate models with observations using blended land air and ocean sea surface temperatures,” accessible here. Chart I The trends for the predicted annual average global surface air temperatures taken from Chart G for the forcing-adjusted (supplied with updated historical forcings from 1992 to date) CMPI5 ensemble (pale green, purple and pale blue lines), and for the UK Met Office Hadley Centre’s HadCRUT4 (blue line) and NASA GISS’s GISTemp (red line) observed global mean temperatures taken from their latest data for a blend of land and ice surface air temperatures and ocean sea surface temperatures. 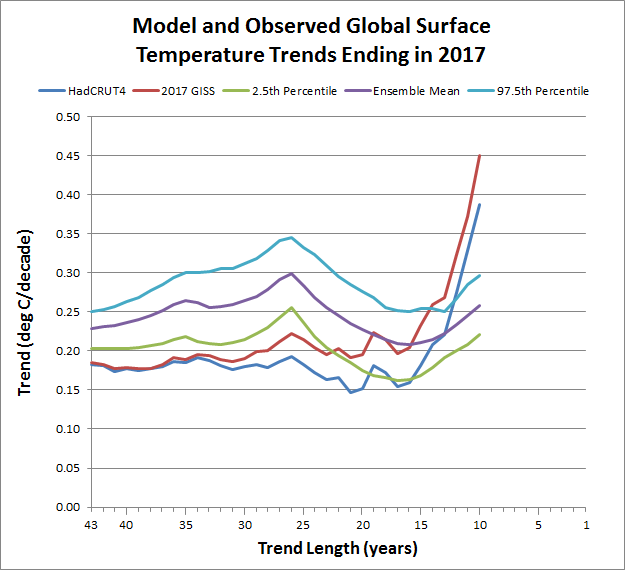 Observed temperatures for 2017 are estimated as explained under Chart G above. The trends were plotted for all years from 1975 through 2008; the trend lengths run from 10 years (2008-2017) to 43 years (1975-2017). The observed temperature trend plots are still low in the long-term trend lengths when compared to the Ensemble Mean, but this time they are within the 95-percent spread, i.e., at or above the 2.5th percentile line. 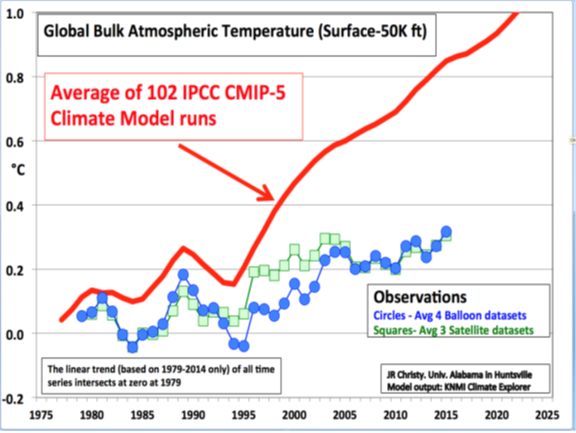 One possible explanation for this is that this CMIP-5 model, as the original one, does not take into account the blend of ocean sea surface and land air surface temperatures. If it did, Chart G would have stated as such. As in Chart H, the observed trends start at 0.18 deg C / decade, there is a peak at the 26-year trend length, corresponding to 1992 the year after Mt. Pinatubo blew up, and after that the observed temperature trends swing in an arc and fly through the roof of the 97th Percentile line, indicative of the twin influences of the Pause and the 2016 El Niño heat spike which the climate is still in, despite the Pacific Ocean presently exhibiting a La Niña. One last interesting tidbit: the Ensemble Mean and the 97.5th Percentile lines converge at the 13-year trend length, a curious coincidence. It should be emphasized that in both Charts H and I the observed temperature trends diverge after the 37-year trend length, with the 2017 NASA GISS line roughly exhibiting a trend of 0.20 deg C / decade and the UK Met HadCRUT4 roughly showing a trend of 0.15 deg C / decade, before both trend lines rocket skyward under the influence of both the 2016 El Niño heat spike and the 2002-2014 Pause. 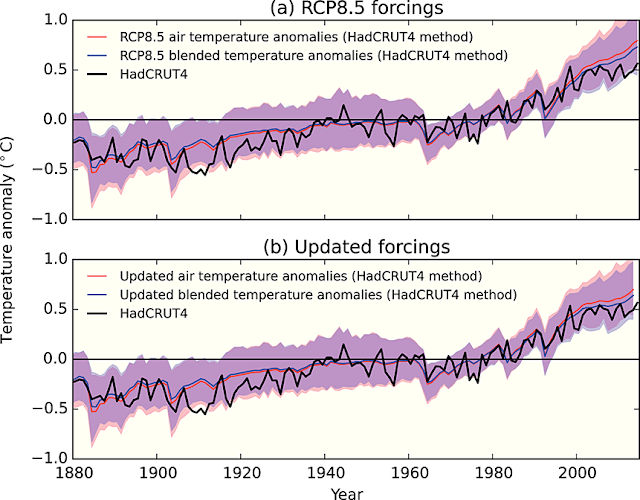 Chart J (Cowtan et al 2015 Figure 4): “Comparison of 84 RCP8.5 simulations against HadCRUT4 observations (black), using either air temperatures (red line and shading) or blended temperatures using the HadCRUT4 method (blue line and shading). The shaded regions represent the 90% range (i.e., from 5% to 95%) of the model simulations, with the corresponding lines representing the multimodel mean. (a) Anomalies derived from the unmodified RCP8.5 results and (b) the results adjusted to include the effect of updated forcings from Schmidt et al. . Temperature anomalies are relative to 1961–1990.” The purple shading is the overlap between the red and blue shadings. Please note in the above chart that the multiple model set of 84 simulations that had the best fit to the observed post-1991 (post-Pinatubo) temperatures was the set that was run with (a) updated blended temperature anomalies (HadCRUT4 method) and (b) updated forcings to 2013. The observed temperatures run through 2014. Neither the updated forcings nor the observed temperatures include the years 2015 through 2017 which have the El Niño warming spike that brought an end to the Pause. For those years’ observed temperatures catching up to the mean multimodel prediction, even with all surface air temperatures, see Chart G at the top. Now what does this mean for the Cato Working Paper No. 35? Despite the paper being correct about the CMIP5 Model Ensemble with its original forcings grossly overstating the predicted warming, it does not follow that the trend lines are levelling off toward zero or even 0.10 deg C / decade. If anything, it shows that taking trends that are shorter than 30 years and extrapolating a lower Charney / ECS climate sensitivity toward a doubling of CO2 from them is a fool’s errand and that the longer trend lengths with their observed trend values of about 0.18 deg C / decade are to be preferred in roughly predicting any future warming. And what was the lower sensitivity favored by the Cato paper? 2 degrees Celsius for a doubling of CO2, which is more than enough to bring on the coming global superstorms that would wreck our civilization. A higher sensitivity, say 3 degrees Celsius, is more likely given the observed longer-term trend values and would be even worse for us because the storms would arrive at a lower CO2 content, that is, sooner. Furthermore, the difference in the surface warming versus the mid-troposphere warming is creating a higher heat gradient between the surface and the mid-troposphere, meaning that more water vapor is going up into the atmosphere, creating more clouds and weirder and more extreme weather in diverse places. After all, we do know our weather has gotten weirder and some climate scientists are on record stating that it has become more extreme. Cato’s Working Paper No. 35 has not held up well at all. Note: Graphs and texts in blue are from the Cato Working Paper No. 35. Note: Texts in blue are from the Cato Working Paper No. 35. Now I am going to compare Michaels and Knappenberger’s historical findings in their Cato Working Paper No. 35 with the 2017 NASA-GISS observational data graph I found at Robert Fanney’s blog “Robertscribbler,” presented below. You will be able to find it at the NASA website, located here (click on "Global Annual Mean Surface Air Temperature Change"). Chart A: The black squares are the annual global mean average estimated temperatures since 1880. Obviously NASA didn’t exist all the way back to 1880 so the older averages were computed from data that were taken from various sources such as the US and British Imperial weather services. The red line represents the “Lowess Smoothing,” I haven’t the faintest clue what that means. The Blue I’s represent uncertainty bars: 0.25 C spread (+/- 12.5 C) in the late 19th Century (1892), 0.17 C spread in the mid-Twentieth (1948) and 0.10 C spread in the late 20th / early 21st Centuries (2009). The 2017 global mean temperature (not shown) is estimated to be approximately 0.92 deg C above the 20th Century average. This graph shows a cooling from 1880 to 1909, the a slight warming ‘til about 1945, another slight cooling until 1976 ad then a consistent rise at roughly 0.2 deg C per decade through 2016. There is a low point at 1992, the year after Mount Pinatubo blew up. The 2002-2014 Pause is hidden in the annual means’ noise but the Lowess Smoothing detects a shorter pause or at the very least a massive deceleration. Well we can use these temperatures to check Michaels and Knappenberger’s plot of the NASA GISS temperature data and I’ve done so by printing the above on an 8½ by 11, drawing gridlines straight across and scaling to the nearest millimeter (half-millimeter if the square falls right between two lines) to the nearest gridline. The temperatures are plotted not in 10th of a degree Celsius, but in hundredths of a degree. So I scaled off from -0.5 to +1.0 and came up with a scale converter. I did the same thing from Cato’s Figure 2 for the GISS multiyear trends, plugged everything into an Excel spreadsheet, used the LINEST command to construct a trend, and down below are the plots. Chart B: The red line is the plot line of the multiyear decadal trends I generated for the reference year 2015 from the 2017 NASA GISS temperature records graph downloaded ‎Sunday, ‎October ‎01, ‎2017. 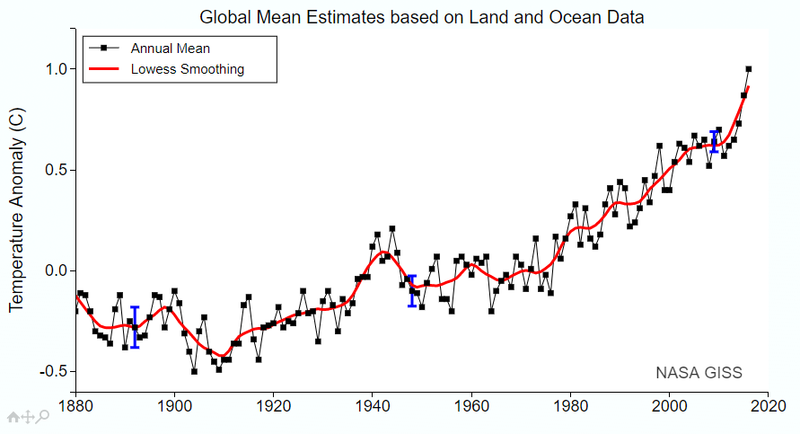 The blue line represents the plot line of the multiyear decadal trends. Note the red line is noticeably forward a year beginning about the trend length of 40 years. Otherwise it is in reasonable close conformity to my red line graph. My plot shows the jump in trend from the 11-year trend length to the 10-year trend length. This is the first year that the signal from 2015 has made itself known to a much higher amplitude within the trends. All subsequent years with their shorter trend lengths are probably excessively noisy. Michaels and Knappenberger’s plot has that one year deviation that I had noticed before, starting at about the 40-year trend length—it is ahead of my plot by exactly one year. This is a fat-fingered error: either in the authors’ Figure 2 graph, or in the stated year runs in its caption. The global cooling from Mount Pinatubo was removed from 1992 to 1993! Any way let the record show that the NASA GISS 2006-2015 trend increased from the authors’ value of 0.12 deg C per decade to the true value of almost 0.20. With errors such as these and the others noted in Part 1, errors that I, a layman have discovered, it really doesn’t inspire any confidence in me that they are doing rigorous enough science---hard science---for it to pass peer review or auditing! Now we are going to check the proper plotline against the IPCC’s CMIP-5 forecast, as shown in the Cato paper. The multiple model runs were based on historical data up to 2006 and the RCP4.5 scenario after that year. 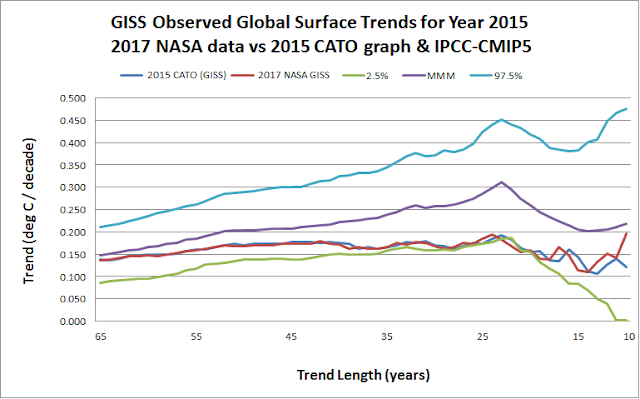 Chart C: Cato’s CMIP5 model and NASA GISS 2015 data set runs showing trends from 1951 through 2006 with reference year to 2015, with my NASA GISS 2017 data set runs for and referenced to the same years. The purple line is the multiple model-run mean, the cyan and spring green lines are the model-runs’ 97.5% and 2.5% percentiles respectively. 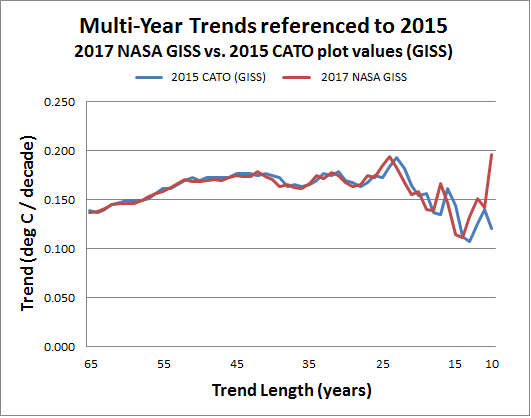 The blue line is Cato’s trend plot from the 2015 NASA GISS data set and the red line is my trend plot from the 2017 NASA GISS data set. Again, this graph shows that the one-year discrepancy that I had noticed in Figure 2 (Part 1) is proven. 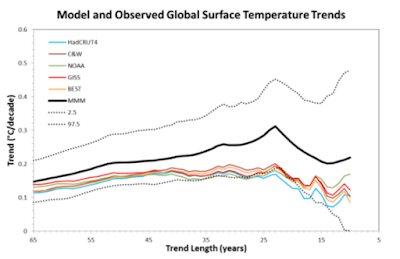 The peaks in the trends as computed by Michaels and Knappenberger are in the 23-years’ trend length (1993-2015), instead of the 24-years’ length (1992-2015) as my NASA GISS plot (red line) shows and is reflective of the actual global mean temperature low point in 1992 (see Chart A). The authors’ GISS plot shows a continued low warming trend of about 0.12 deg C per decade whereas mine increases to 0.200 deg C per decade and close to the multiple model-run mean (MMM). Now to find out the source of the Cato paper’s discrepancy I took their plotted NASA GISS values from Figure 2, and compared them to my computed trends for the NASA GISS temperature records from 1950 through 2005 and referenced to 2014. When I made a plot, my numbers and the paper’s numbers became widely variant when running into the shorter trend lengths, so I won’t belabor the point here. Chart D: The Cato paper’s CMIP5 model and NASA GISS 2017 data set runs showing trends reset to beginning in 1950 and ending in 2005 with reference year to 2015, with my NASA GISS 2017 data set runs for and referenced to the same years. “Annual years” are the years for the starting points of the respective trends. End points for all trends is 2015. The trend lengths now vary from 66 years (1950-2015) to 11 years (2005-2015). Explication of colored lines are the same as in Chart C.
We have also updated our AGU presentation [in December 2014] with our best guess for 2015 average temperatures. The actual NASA GISS global mean average temperature for 2015 was apparently higher than the authors’ estimate, and the other actual data sets would probably show higher 2015 averages as well. The gross errors that were introduced in Figure 2 (Part 1) and the discrepancies between Figures 2 and 3 are probably due to the author’s stated updating without checking to make sure that their trend lengths in the graph and stated run years in Figure 2’s caption were correct, as they are not. Now on to checking Cato’s Figure 3. 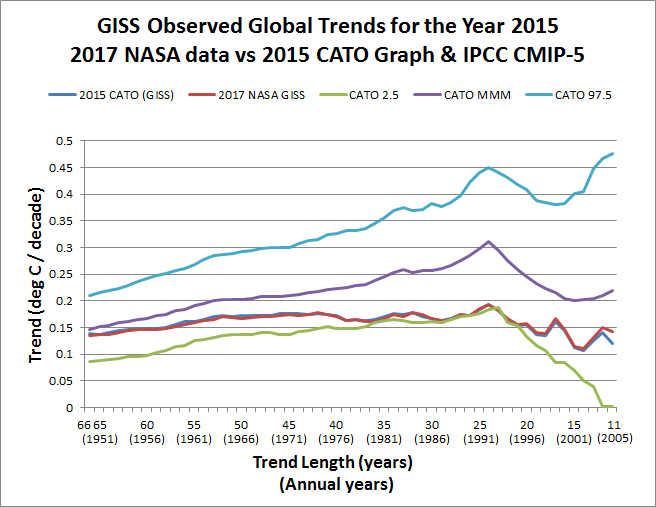 Chart D: The Cato paper’s CMIP5 modified model set and the 2014 Hadley HadCRUT4 data set (blue line) compared with the 2017 NASA GISS data set (red line) for all trends with end year reference of 2014. Trend lengths begin with 65 years (1950-2014) and end with 10 years (2010-2014). The Model set has been modified according to the Hadley HadCRUT4 Method to reflect a blend of land surface air temperatures and sea surface temperatures, and obtained from the University of York website (http://www-users.york.ac.uk/~kdc3/papers/robust2015/index.html). Explication of the model set’s colored lines are similar to those in Charts C & D.
In the above Chart, the NASA GISS trend plot line roughly parallels the HadCRUT4 line until about the 45-years’ trend length, then follows in close conformity thereto until the 27-years’ trend length, whereupon the two lines diverge. Both lines hit a peak at the 23 years’ (1992-2014) trend length—right after Mt. Pinatubo blew up, after which they slowly descend roughly parallel to each other until they hit a low point at 2005. This descent is indicative of a steadily but noisily increasing mean of global temperature until 2002, where it levels off, going into the Pause which ended in 2014. 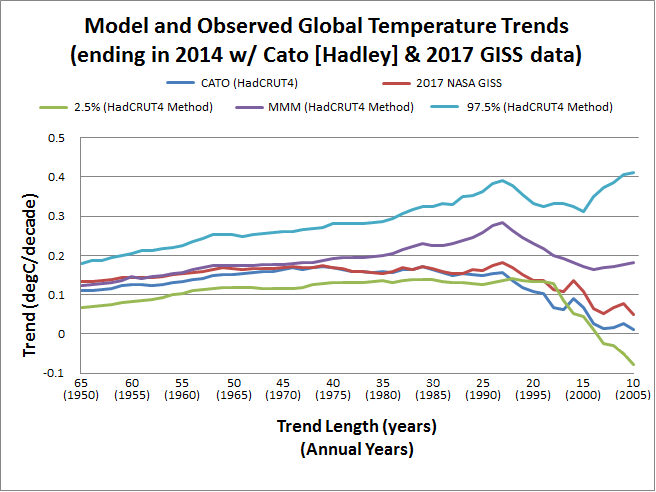 The parallel descent into very low decadal trends indicates that Michaels and Knappenberger had referenced their Hadley data set trends in their Figure 3 for the end year of 2014, and is not indicative of fat-fingered errors at the Cato institute. It also means that Figure 3 is, essentially, correct. I am unable to check Figure 4 owing to the fact that Christy’s data in Figure 1 went by annual five-year global mean temperatures and his corresponding data in Figure 4 went by annual means as indicated in the two figures and their captions. So I will compare the model forecasts with the observed temperatures in Figure 1 instead. 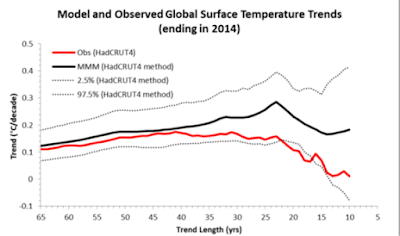 Chart E. The Cato paper’s CMIP5 Model set for the tropical mid-troposphere compared with the 2015 Christy balloon data sets (red line) for all trends with end year reference of 2015. Trend lengths begin with 40 years (1976-2015) and end with 10 years (2006-2015). The temperature data from the Model set and the balloon data sets have been provided to the Cato Institute by Dr. John Christy of the University of Alabama in Huntsville. The results are similar to what is seen in Cato’s Figure 4. The data from Dr. Christy comport with the Figure 4 trends that run significantly lower than the mean of the multiple model runs (MMM) and even below the 2.5th percentile line. The plot line shown here also runs below the minimum for all runs from the 33-year to 23-year trend lengths. The plot line also confirms the sense of Figure 4 in that the trends are running almost uniformly at 0.1 deg C per decade. A caution noted here is that Christy’s observational data are from the five-year running averages shown in Figure 1, so some noise has been eliminated from the data. A comparison of this graph with Charts C and D shows that through 2015, when the trends end outside the Pause, the tropical mid-troposphere appears to be warming at a slower rate than is the surface, possibly giving a greater differential between surface and mid-troposphere temperatures and thereby allowing for more moisture-laden air to arise from our lands and seas to supercharge our weather, although a caveatshould be noted that the tropical mid-troposphere temperatures should be compared with the tropical surface temperatures and that temperatures at altitude are expected to warm much less than the surface at higher latitudes. Conclusion on Checking Cato’s Figures. Although Michaels and Knappenberger’s Figures 1, 2 and 3 appear to be correct, and their discussion is for the almost the whole very well written, I cannot recommend this paper to anyone without serious reservations because of the gross errors they introduced into Figure 2 when they updated it for release of the paper at the end of 2015. It would have been better they left the plot lines remaining as they were in 2014, as they did for their Figure 3. They have also failed to do another check, which is to compile uniform multiple-year trends, for example, 30-year trends going back from 1985-2014 to 1921-1950. Well I’m up to 2,000 words now. I will leave it for Part 3 to see if this paper has held up under the increased temperatures of 2016 and 2017. Cato Working Paper No. 35 — How Well Has It Held Up? Back at the end of 2015, the Cato Institute published a paper titled, Climate Models and Climate Reality: A Closer Look at a Lukewarming World (Patrick J. Michaels and Paul C. Knappenberger), which assessed that the rise in global mean temperatures expected under Global Warming and forecast by the various models were much higher than those temperatures that actually transpired almost through to the end of 2015. Almost, because their paper only covered a portion of that year. Needless to say, the actual means of 2015, 2016 (and so far in 2017) appear to indicate that the paper is not holding up very well in its main historical finding: that the globe is warming at a slow trend of only about 1 degree Celsius per decade, with an apparent deceleration from 0.17 (Hadley) / 0.19 (GISS) for 1993-2015 to 0.10 (Hadley) / 0.12 (GISS) for 2006-2015. 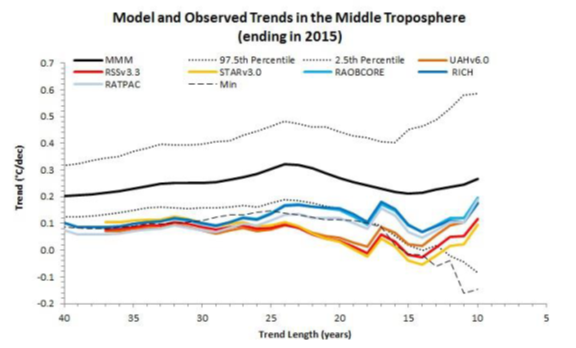 This paper starts with the finding of University of Alabama’s John Christy, presented to the US Senate Subcommittee on Space, Science and Competiveness, that the mid-troposphere temperatures have been increasing by the more moderate trend of about 0.1 deg C per decade to 0.32 deg C in 2015, a far cry of the IPCC model runs’ predictions’ average of 0.2 deg C per decade and hitting about 0.86 deg C in 2015. Rain and snow are largely dependent on the temperature difference between the surface and the mid-troposphere. When there’s little difference, air in the lower atmosphere does not rise, meaning that the vertical motion required to form a cloud is absent. When the difference is large, moisture-laden surface air is very buoyant and can result in intense rain events. Getting the vertical difference systematically wrong in a climate model means getting the rainfall wrong, which pretty much invalidates regional temperature forecasts. A dry surface (think: desert) warms (and cools) much more rapidly than a wet one. 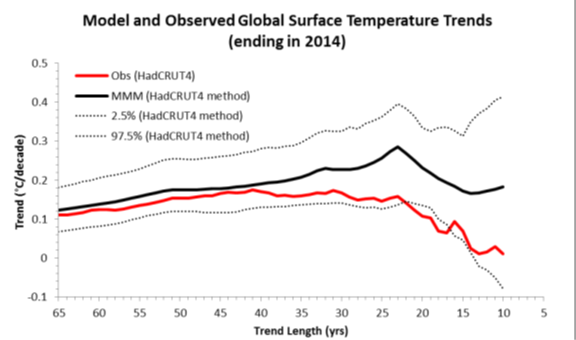 If the computer models are somehow getting surface temperatures right that could only be a fortuitous result if the mid-tropospheric temperatures are as far off as Christy’s data shows. WRONG. If the mid-tropospheric temperature data are as far off from the models as Christy’s data shows and the surface temperature data are matching the temperatures predicted in the models, that means the temperature differences between the surface and mid-troposphere are getting larger, meaning more intense rainfall events! 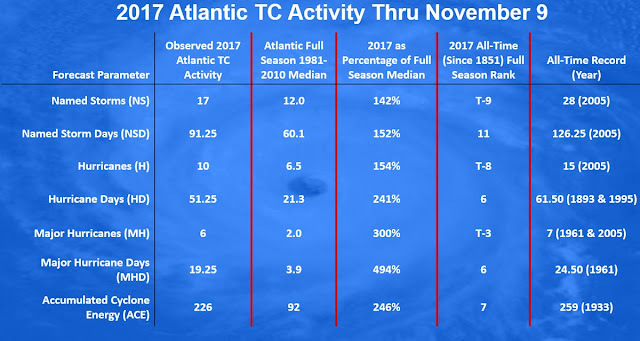 Maybe more intense windstorm events, too… we have had five major hurricanes in a row in the Atlantic oceanic basin including the Caribbean and the Gulf, a record first for this ocean, and a 185 MPH monster of a hurricane, boasting the highest tropical cyclone winds ever recorded in the Atlantic. It would be better for us if the surface temperatures are increasing only as slowly as the temperatures in the mid-troposphere are increasing, for that would mean the temperature differences between the two levels are not becoming any greater, and the weather is not becoming any weirder or any worse. Which brings us to those pesky surface temperatures. 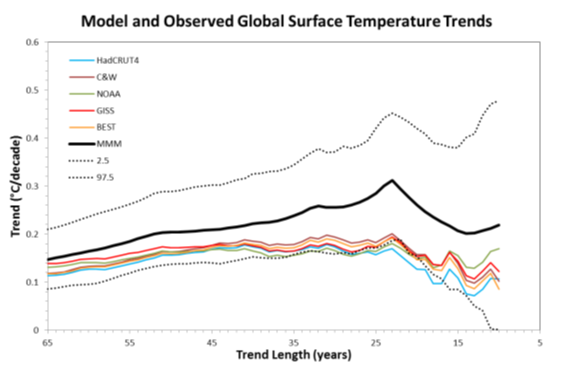 As you can see, the paper shows a leveling off of the decadal trends at trend-length of 41 years (1976-2015, inclusive) onward at roughly on average about 0.19 deg C / decade until the trend-length of 23 years (1993-2015) where it then decelerates unevenly to a rough average of 0.11 deg C / decade at trend-length of 10 years (2006-2015). The decadal trends indicated by the Hadley Centre and the NASA GISS data decelerate from 0.17 to 0.10 deg C / decade and from 0.19 to 0.12 deg C / decade, respectively. 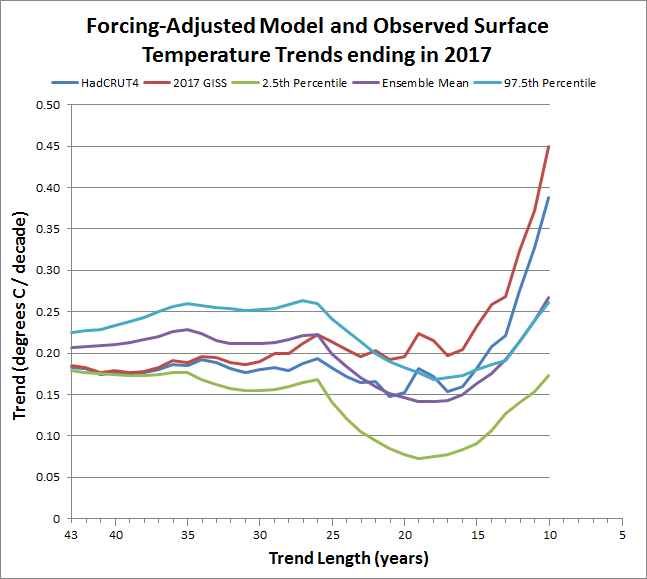 The observed temperature trends fall below the multiple model-run mean (MMM) and for several trend-lengths they lie very close to or even below the 2.5th percentile margin for all the model runs. But before going on, I have an explanation of this graph to describe. The forcings used for the model predictions are not consistent throughout—the IPCC included the historical forcings up until 2006 but after that year used the four various RCP forcings to predict “future” warming rates under their respective scenario. For the purpose of this study Michaels and Knappenberger picked the RCP 4.5. I was hoping the authors’ technical help would have reprogrammed the models to use the historical forcings to as recently as possible for greater accuracy, and to really see if the models are way off even with historical forcings throughout, but I suppose that in the end they were stuck with one of the four forcings. But then it doesn’t matter which one is picked, for all four of them are virtually identical in forcing predictions under “business as usual” until the year 2020. Also please note that the lower the trend for past years, the higher the past year’s global mean temperatures is in respect to the 2015 means, when compared to adjacent years of higher trend value. Conversely, higher trends are indicative of the respective past year’s lower temperatures when compared with its neighbors. This is important. Now I have a bone to pick over this graph. If you notice, the trend peak that is roundabout the 25 years’ trend length (1991-2015) is located at 23 years (1993-2015). This is true for both the model runs (except for the 2.5th percentile plot line which is at 22 years) and all the observed temperature trends. Unfortunately, these are all a year off toward 2015; because, since Mount Pinatubo blew up toward the end of 1991, the observed temperature records show in reality a low point for the global means in 1992. 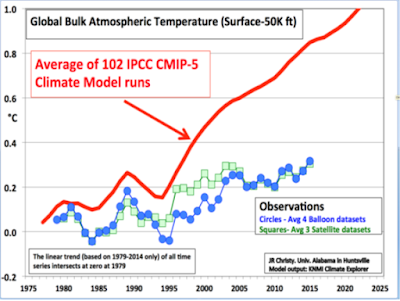 I have seen other plots of the IPCC-CMIP5 and they show the models’ low point in 1992 also. The above discrepancy is a gross error and should not have been allowed to be presented to the public uncorrected. Now we go on to the next graph. observed compilations combine air temperature measurements over the land with sea surface temperatures into a global average, while climate model compilations use air temperatures over both land and oceans. meaning that the model probably has a slight warming bias compared to the observed data, or that the observed data are underestimating the actual warming! So a new model dataset (http://www-users.york.ac.uk/~kdc3/papers/robust2015/methods.html) was developed and made available that took into account the different temperature data takings between land and sea—and it shows a slower global warming mean in the model, one that is roughly consistent with the observed data until the 41-year trend length (1975-2014 [see below]) at which point the two lines start to diverge from one another, showing a warming bias still in the adjusted models. Now the above graph appears to have some really gross errors introduced into it; for what reason I cannot say. First, the Hadley trend-line is at wide variance from that shown in Figure 2. Either they ran the observed temperature trends with reference to 2014, or they really put some really fat-fingered errors in it, to wit: The plot line of trends has been bent or otherwise “adjusted” at the 18-year trend length and the 35-year trend length so that it slopes further down for the smaller trend lengths, compared to those of the same line in Figure 2. Even the slopes of the line between the 18-years’ length and 10-years’ length is noticeably different to the naked eye. And of course, this reflects variances in the trend values from those in Figure 2, especially so for the shorter trend lengths. This in my book is a gigantic mistake: either Michaels and Knappenberger computed the trends from the data sets with the reference years at a one-year variance between Figure 2 and Figure 3 (i.e., 2015 and 2014), or they “adjusted” the data from the one figure to the next. This last is inexcusable. Second, the model runs in Figure 3 are different (reference year 2014) from those in Figure 2 (reference year 2015). This to me is just as big a glitch as the second error I discovered, for we are no longer comparing apples to apples, but apples to oranges. I cannot say this emphatically enough; the model runs and the Hadley Centre’s observed data plots ought to be identical in both Figures 2 and 3! There should be no room for such gross discrepancies as this. Before I verify or debunk the these findings, allow me to take an excursis back to the mid-tropospheric temperature trends as the Cato authors do in their working paper. 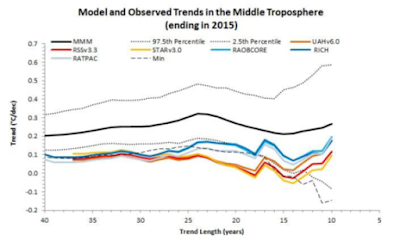 The above shows that the observed mid-tropospheric temperatures ran far below what the IPCC model runs predicted. 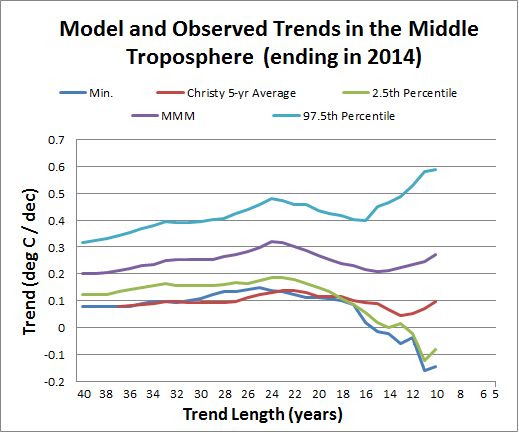 So bad, in fact, that some of the observed data trend-lines run below the minimum model run line and they all basically run below the 2.5th percentile line for a good portion of their length before rising to a mean average of about 0.16 deg C / decade at the 10-year trend length, with Christy’s data trend, UAHv6.0, coming out at 0.18 deg C / decade for the ten-years’ trend length. Still, the general rough average trend for all years is about 0.1 deg C / decade, with obvious variations, of course. And I notice that the longest trend length is 40 years, with the data starting in 1975 according to the caption and ending in 2015. Yet 40 years inclusive from 1975 would bring us to 2014. And if the ten-year trend length is set to begin in 2006, the 1979 data would appear in the 37 years’ trend length, which it does! For proof, see the Christy / Univ. of Alabama in Huntsville (orange) line above and his data in Figure 1 at the top. And the orange line appears to show a higher trend when compared with Christy’s data in the top figure—because the above line goes by the annual averages and the Figure 1 data are annual five-year averages. Ugh! I’ve run through 2300 words now so the rest I’ll have to include in later parts.